Social and environmental practices beyond compliance have been an integral part of Sambhav Group's philosophy since its inception. These investments were undertaken with an innate sense of responsibility towards the well-being of society and environment. In recent years, with a view to cement these relationships, the initiatives have become more structured and have been seamlessly integrated in our business process. We, at SBT SPINTEX PVT. LTD., strongly believe that any development at the cost of the irreparable exploitation of natural resources is not acceptable at all. Hence we have consciously made an attempt to work within the framework of nature. We continuously strive towards sustainable development and have always made sure to conduct our activities in an eco-friendly manner. We believe that businesses exist to sub-serve larger societal goals. Therefore, their contribution is best measured by the value they create for the society at large. Safety of people handling complex processes. Regular initiatives for their upliftment. SBT SPINTEX PVT. LTD. has always believed that businesses must play a more meaningful, involved and active role in the creation of a more sustainable and inclusive future. In continuing with our policy, we have been persistent in our efforts to regularly conduct tree plantation drives in and around Raipur so that the future sees a better tomorrow. Also, medical camps for blood donation and health awareness have been regularly taken up with other industry partners. In line with the above thought process, we have developed a green-belt in all our establishments to reduce carbon dioxide emissions and maintain ecological balance. Serving the underprivileged to overcome their problems and become a part of the mainstream has always been a part of our DNA. 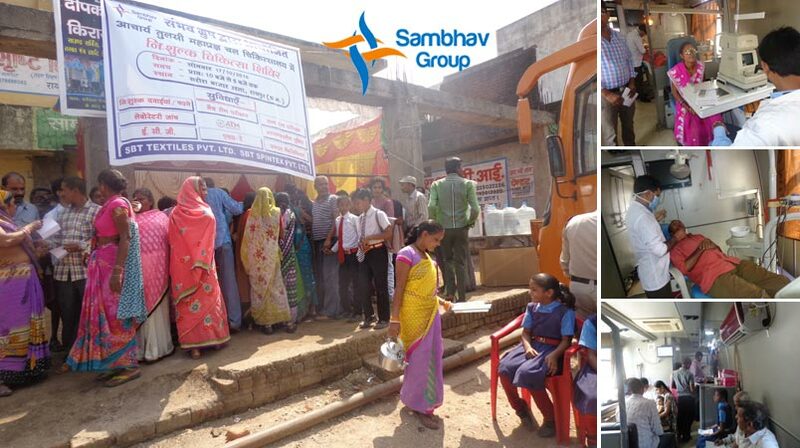 The Group channels most of its philanthropic activities through Sambhav Foundation, a social NGO. It has adopted schools in and around Urla, Raipur wherein it has given scholarships to poor meritorious students so that their quest of knowledge remains unhindered. Sambhav Foundation is an active organization working at the grass-root level for the alleviation of poor and underprivileged and has made a difference to the lives of several people.